More than 5,000 square meters (more than 53,820 sq. feet) of tempered, laminated glass with DuPont™ SentryGlas® interlayer went into forming the exterior glass balustrades and windscreens on the cruise ship, Ruby Princess, the newest vessel in the Princess Cruises fleet. The Italian ship builder Fincantieri adopted a new, light balustrade system from Somec Marine & Architectural Envelopes SRL, Italy. It features SentryGlas® laminate to reduce weight and ensure compatibility with new safety standards at the same time. “This is our first big marine project, but our expectation is that many new cruise ships will be using this unique DuPont solution,” said Luigi Robbiati, director of growth - DuPont EMEA. "The weight reduction and increased safety achieved through SentryGlas® helped us in the approval process for this application." 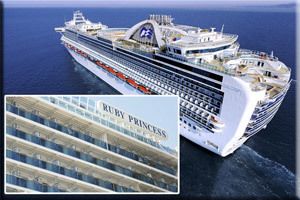 On the Ruby Princess, SentryGlas® delivered a weight savings of approximately 50 tons. That is the level of improvement versus a standard laminate with a polyvinyl butyral (PVB) interlayer. In addition, SentryGlas® provides the benefits of enhanced structural performance, excellent post-glass breakage performance and high durability in a marine environment. The $400 million ship has a displacement of 113,000 gross tons, an overall length of 290 meters (951 feet), and a width of 36 meters (118 feet). The 1,549 cabins are spread over its 19 decks, and the ship can accommodate up to 4,800 passengers.